Riding behind the 2017 Aston Martin DB11’s twin turbo V12 feels like having an elegantly stitched saddle on a sea monster. Under a hard charge, each shift is the crack of a forty-foot whip. Release the throttle and it’s a leather-lined pod of tranquility, a grand tourer that is truly grand. If this car really is a harbinger of Aston’s future, the next seven years are going to be exciting. The DB11 is Aston Martin’s debutante redux. Going into its second century, the company wants to be more than just the James Bondmobile. And speaking of 007, the DB10 was made just for his movie if you’re wondering why we’re skipping from DB9 to DB11. The DB11 is the first of what Aston promises will be a long line of new models coming out over the next seven years. As it stands, the DB11 will replace the DB9 directly to slide between the Vantage and Vanquish in the company’s lineup. The platform is new. The engine is new. And the transmission has been around, but not quite in this form, and not in an Aston Martin. The DB11 is built to be driven swiftly, slowly and anywhere between 1 and 200 mph in opulence and comfort—not assault the road like a smaller sports car might. That said, you should have no problem raising hell in this boat if you’re brave enough to toss a quarter million dollars around the road. Aston Martin claims the DB11’s V12 generates 600 horsepower and 516 lb-ft of torque. The engine’s new, made by Aston Martin and not Mercedes-AMG like some of the company’s other powerplants. And not just made, handmade, by a person whose name is engraved above the intake manifold. All that power from the front-mounted engine goes through a ZF 8-speed automatic you can shift with paddles, to the rear wheels only, as god intended. 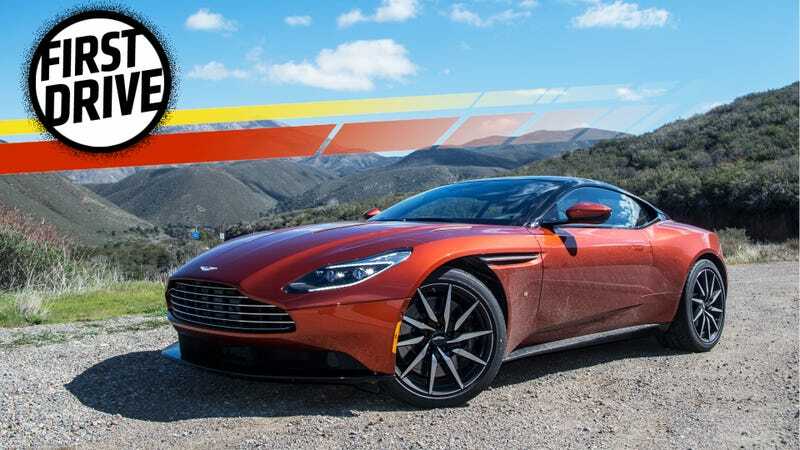 The DB11 starts at about $212,000 and is as physically imposing as its price tag: the thing spans 187-inches bow to stern and displaces an enormous 81-inches of road lane in width. That’s just about one horizontal iPhone skinnier than a Ford freaking Raptor desert truck. But a lot of the car’s shaping is actually functional according to Aston Martin’s Senior Manager of Vehicle Dynamics, Ian Hartley. As he explains in this video, every little slit and scoop moves air to where it can help keep the car better balanced. Opening the oddly up-swept doors (saves pinging curbs, you know) and swooping into the cockpit, I was instantly comfortable with the scale and ergonomics of the interior. There’s enough distance between your body and everything else that you don’t get the claustrophobic feel of a smaller coupe like a Jaguar F-Type, but the door sills are so high and the roofline is so low that you’re almost wearing the car rather than riding in it. Yeah, there’s a lot going on here. And if it’s something you’re wearing, it’s a brand-new heavy leather coat because as soon as you get close to the thing you’re drenched in the scent of conditioned cowhide. The gauge pod’s also worth mentioning here, as it was incredibly modern, yet elegantly simple and clean. Gauges change as you switch between GT, Sport and Sport + modes increasing aggression on shifts and throttle response. As we got moving, I started playing with some of the car’s mechanical features. The DB11 uses electric steering to meet efficiency regulations, rather than a hydraulic system like its predecessors. Find me a car that doesn’t these days, besides the Alfa Romeo 4C. Electric steering has been known to deaden the feedback between car and driver, so some enthusiasts have had concerns that the DB11 might have lost something in this transition. Hartley told me perfecting the DB11’s steering system was one of the development team’s greatest challenges. He seemed pretty proud of what his team had been able to pull off, and I can corroborate that the DB11’s steering felt beautifully weighted and responsive. The wheel’s a bit of a strange, not-quite-circular shape and is really chunky for my liking. But moving it left to right felt very smooth, direct and deliberate. I didn’t notice any unresponsive “dead-zone” in the middle as I’d been warned to watch out for. So the steering is fine and good and if you were worried it wouldn’t be an Aston without liquid pushing the front wheels around, you can relax. But the DB11’s not a canyon carver anyway. It’s a grand touring car, made for crushing endless avenues in comfort. It can do that, of course. That’s “touring.” It can also surge from a saunter to a gallop in the time it takes to raise an eyebrow at a preposterous proposition– and that’s where the “grand” comes in. The car is plenty fast. And when the extra exhaust baffles open up in Sport+ mode, it’s noisy too. But it’s the paddle shifters that make hard acceleration in the DB11 a gloriously dramatic experience. Two tall, girthy pillars of smooth metal frame each side of the steering wheel. They’re shaped like the hilts of little sabers and, as if just resting two fingers on one wasn’t exciting enough, actually pulling them was one of the greatest haptic experiences I’ve ever felt driving. The paddle travel is remarkably long, the engagement points deep and distinct. And that sound! Banging up a gearchange is like cocking a pump-action shotgun, with the same sensation of power and danger a well-oiled weapon bestows. Believe it or not, the mighty V12’s exhaust falls to a (close) third place in the auditory excitement you set off when you mat the gas in this car. First are those shifters, and the second best sounds the DB11 makes are the massive air gulps the turbochargers swallow as the car accelerates. That three-piece orchestra comes together to sing the battle cry of a monster and the crescendo is as exhilarating as the speed you’re traveling. Which gets ridiculous in short order. At a canter or cruising speed, the ZF 8-speed shifts as smoothly and seamlessly as we’ve experienced in BMWs, Audis and Land Rovers. Under hard throttle, it takes on a more distinctive characteristic of very deliberate upshifts. While a Porsche PDK snaps up gears quicker than you can sneeze, this ZF as it’s set up for the DB11 takes an appreciable beat to go from one gear to the next. Hard to say if it’s a significant hindrance to the car’s sub-four-second 0 to 60 time, but it certainly adds some personality to the fast-merge experience. That sweet looking intake soaks up every scrap of dirt on the road. Well, it sure does use a lot of gasoline. We observed about 12 mpg in a little over 100 miles of mixed casual and aggressive driving. 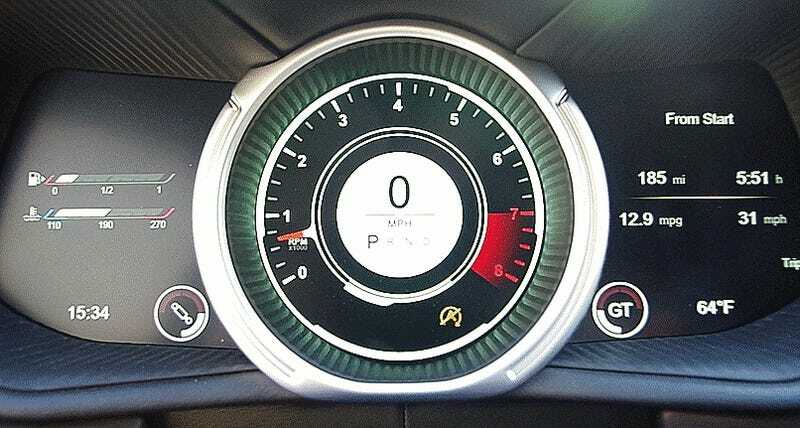 I could have sworn the fuel range read a little under 200 miles before we took off, but Aston Martin’s team tells me that’s impossible since the car’s rated to 17 mpg in combined driving and has a 20.5-gallon tank. More significantly, the brakes felt a touch weak. At least compared to the DB11’s meteoric 200 mph top speed. A convertible Volante version is surely in the pipeline. But I think I’m going to need a few hundred more miles to make sure I really liked the sensation of that shifter as much as I think I did. Joking aside, I am curious about how durable Aston Martin’s shiny new engine ends up being; I’d like to take a closer listen to wind noise and spend more time observing stability at speed, too. If I were to have, hypothetically, driven this car very, very quickly in a straight line, I might have, hypothetically, felt like it was wiggling around a lot more than one might, hypothetically, expect. Intensive research is required to confirm or disprove my hypothesis that the car might get a little wobbly deep toward the upper end of its speed capability. We also didn’t have time to dig too deep into the Aston’s infotainment system (made by Mercedes) or its HVAC interface (a lot of glossy black buttons, like a Cadillac or a microwave) and I didn’t spend much time in the back seat either. I’ve seen your comments about the DB11 being ugly, and I reject them. I’ve heard the criticisms that “an engine never sounds as good with turbos,” and well, I’m not convinced I care. What’s undeniably established is that this car has a massive presence inside and out. The interfaces are easy and elegant, performance is impressive and I’m going to be thinking about pulling those shifter paddles every time I need to hype myself up for the next days and weeks. The DB11 is a beautiful manifestation of the grand touring car: It’s exceptionally comfortable, it’s exhilarating when you ask it to be and it exudes personality no matter what speed it’s traveling at. 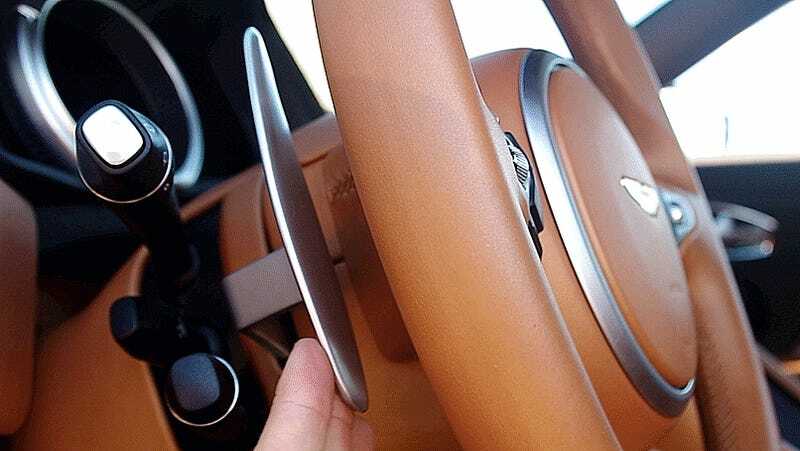 The future of Aston Martin is in good hands, even if those hands are on a wheel connected to electric steering.